This is a 13 by 13 bouncer with a Dora banner. Great for girls!. Has a basketball hoop inside and plenty of jump space! 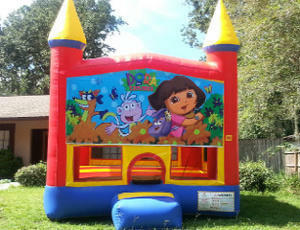 We can deliver your bounce house rentals in Tampa, east tampa, west tampa, new tampa, ruskin, bounce house brandon FL, riverview, lutz and all of hillsborough county.